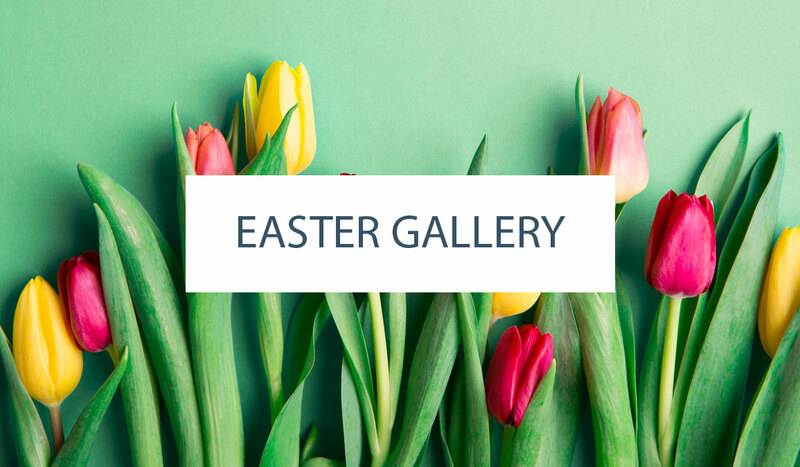 We’re thrilled to welcome our newest contributor, Summer Stone of Cake Paper Party! Join along as Summer explores traditional baking concepts in new and exciting ways. 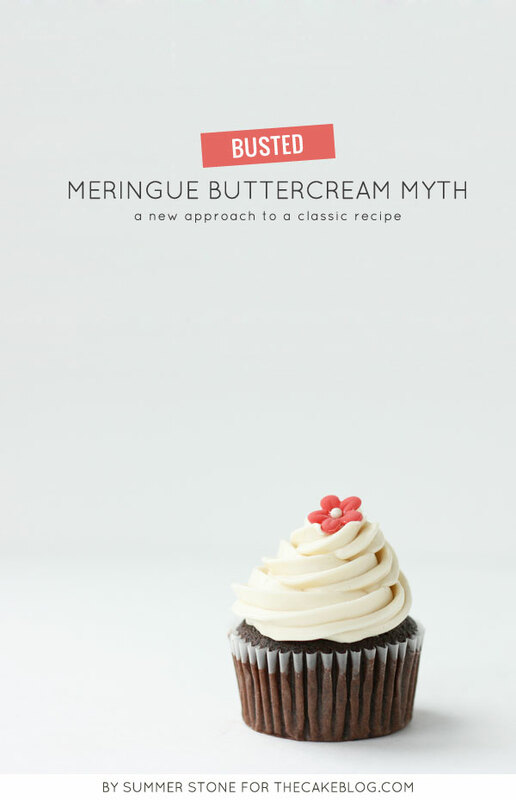 CAKE MYTH : You must create a meringue in order to produce a European-style buttercream. For some time, I puzzled over the idea that you have to create a fully realized, stable meringue in order to make a Swiss Meringue Buttercream (SMBC). I wondered why one would create a beautifully peaked meringue and then destroy it by adding in loads of butter. I also wanted to know why SMBC’s were so inherently unstable and even the most practiced of bakers sometimes had difficulty making them behave. After much experimentation, I have found answers that will help you make buttercream faster and easier than ever before. You will find that you don’t need a meringue at all! Egg whites serve two important roles in SBC. They act as a structural component and serve as a liquid to dissolve granulated sugar into. 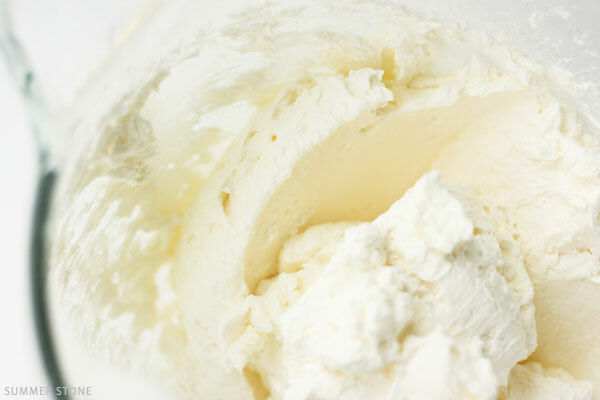 In traditional SMBC, egg whites are beaten to peaks as a means of incorporating air into the buttercream. The problem with this is that protein mediated air pockets are very unstable in the presence of fat. When butter is added, much of the air which was beaten into the eggs is lost and it they become a syrupy puddle. Here I have used pasteurized egg whites from a carton, but separated egg whites from cracked eggs work just as well. Sugar obviously plays an important role as a flavor provider in a buttercream but it also serves to thicken and stabilize the egg liquid it is dissolved into. 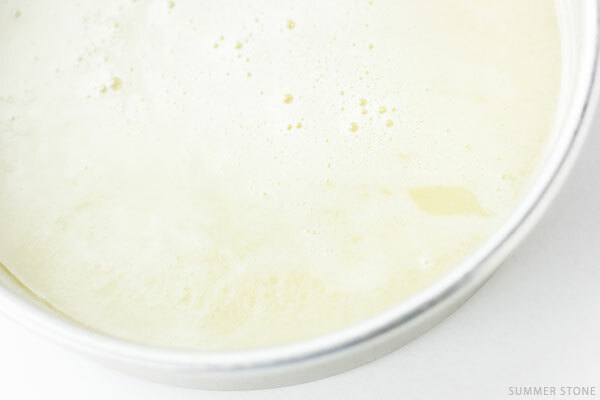 The sugar-egg combination, when mixed with butter, creates an emulsion that is more stable than either individual component. The eggs and sugar have a symbiotic relationship. The eggs serve the sugar by providing a solvent into which it can be dissolved. At the same time, the sugar helps the egg whites by weakening their ability to coagulate allowing them to remain in a liquid state. 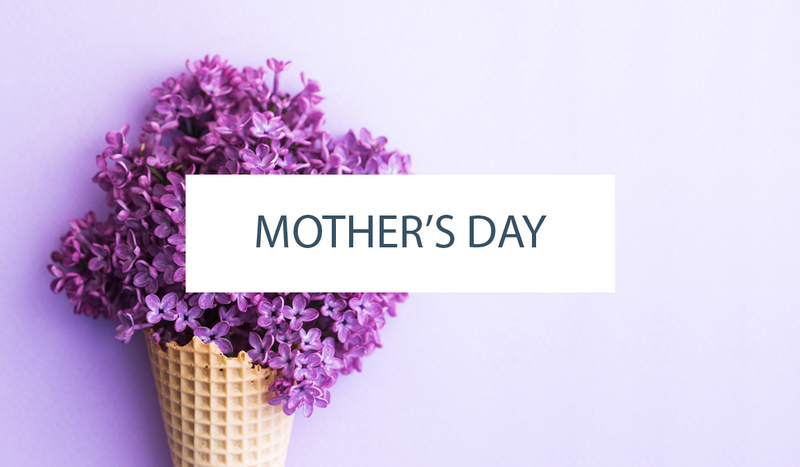 Be sure to whisk the eggs and sugar together very well for maximum benefit. No one likes scrambled egg buttercream! 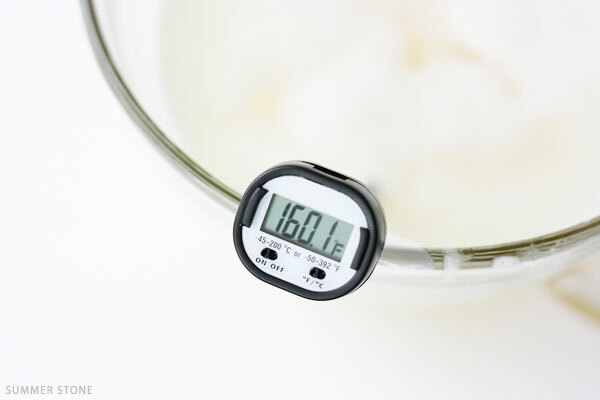 While the egg whites are helpful in dissolving the sugar, at this high of a sugar concentration heat is required to fully dissolve the sugar crystals. Heat also functions to destroy any harmful bacteria that may be living in the egg whites (particularly if they are fresh). For this reason, you should heat your egg-sugar syrup to 160ᵒ F which will ensure Salmonella is killed. I find the easiest way to do this is in the microwave. One recipe will take 3-4 minutes stirring at one minute intervals. Alternatively you can heat the syrup in a double boiler until a safe temperature is reached. At 160ᵒ F all sugar crystals should be dissolved. I like to add a half ounce of corn syrup to the sugar-egg mixture to minimize the chances of recrystallization. Be sure to stir in any sugar granules than remain on the sides of the bowl. One undissolved rebel sugar crystal can reseed the whole batch. I place my syrup in a clean cake pan and place it in the freezer for 20-30 minutes to reach a cool/cold temperature (45-60ᵒ F). 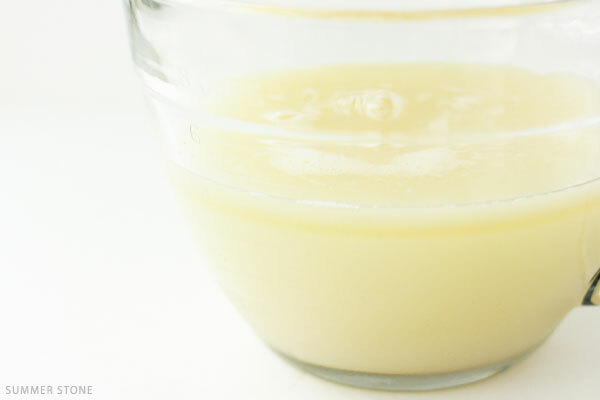 When the sugar syrup is added to the butter in this temperature range, the two components generally go into emulsion seamlessly without “breaking”. This seems to be one of the problems with traditional SMBC. Since a meringue will not form readily in a cold syrup, the eggs and sugar would have to be at room temperature when the butter was added. This room-temperature blending stresses the combination and makes formation of a proper emulsion more difficult. 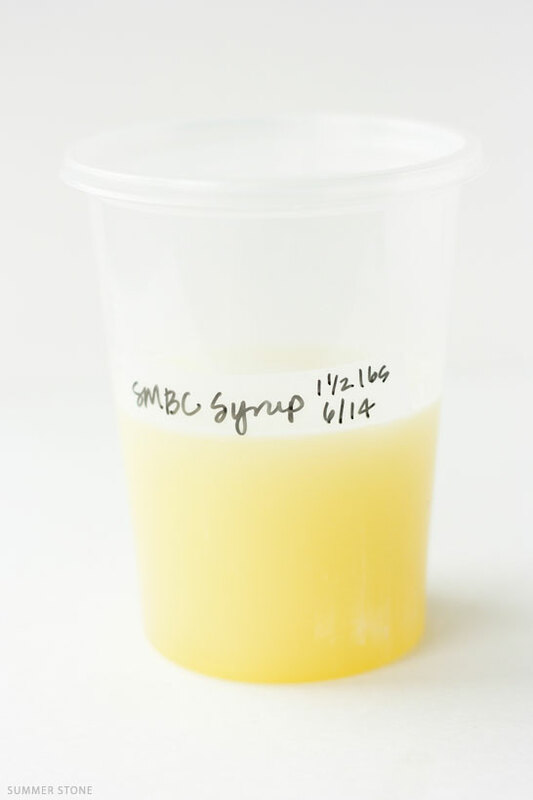 One of the advantages of making SBC by this method is that you can make large batches of syrup and freeze the extra for quick and easy batches in the future. In the photos above, I made a double recipe of syrup and saved half for a future batch. Butter is the all-star of SBC. It does the amazing emulsifying work. For this reason, it makes the most sense to start with the butter and add the cooled syrup to it. When the butter is beaten on high for 2 minutes before the syrup is added, it lightens the buttercream and takes in air in a way that is more structurally sound than that of beaten egg whites. I like to start with butter that is at a cool room temperature since it holds air better in a more solid form. 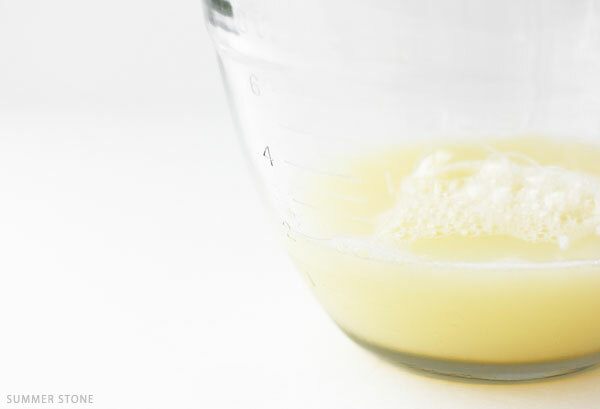 Adding half of the liquid at a time allows the mechanical action of the mixer to work to develop the emulsion without overwhelming the butter and causing the mixture to break. Beat for one minute to fully incorporate the syrup before adding the final half. Add the second half of syrup to the butter mixture and beat on high to complete the emulsion and incorporate air into the mixture. The buttercream will be quite firm at this point. Adding liquids such as vanilla not only incorporates flavor but the liquids also smooth out and lighten the texture of the buttercream. At this point, the buttercream will be very firm and stable. If you would like a creamier buttercream that is less sweet, you can add additional butter, up to another 4 ounces. 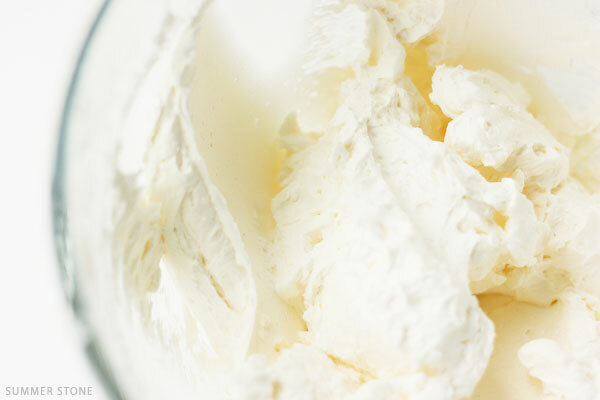 If you want a buttercream that is lighter in texture, more like whipped cream, you can add more liquid in the form of milk, sour cream, cream cheese, juice, alcohol, fruit purees or water. I have added up to a half a cup of cool water per recipe with success. Slowly drizzle in the additional liquid while the mixer is going on medium speed. 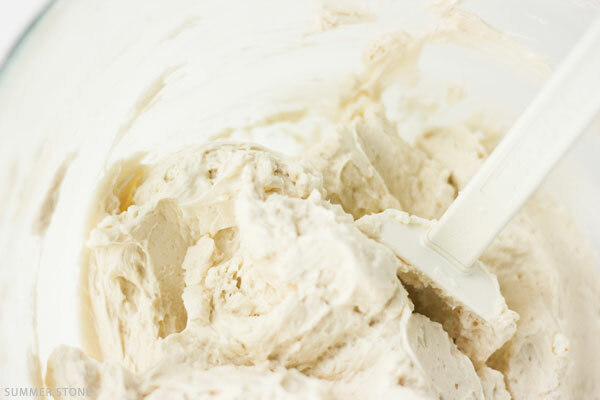 I hope you enjoy this alternate method for making a Europen-style buttercream and that you find it easier and more fool-proof than ever before! Happy baking! 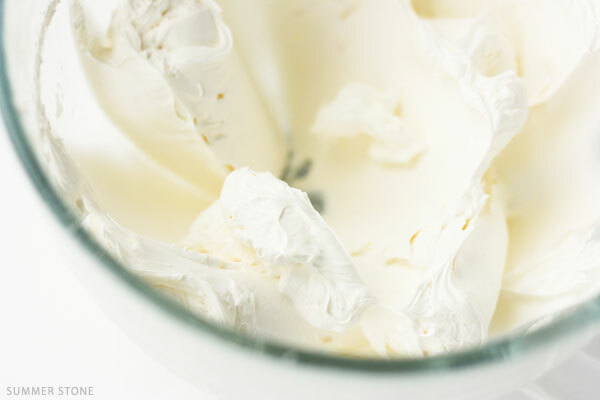 Whisk egg whites and sugar together in a microwave-safe bowl. Make sure the mixture is well mixed so the sugar can protect the eggs from cooking. Heat the mixture in the microwave for 2-4 minutes on high in 30 second intervals whisking well after each 30 second heating. Heat until the sugar is dissolved and the mixture reaches 160ᵒ F/72ᵒ C. (Alternatively this step can be carried out in a double boiler over simmering water). Pour the syrup into a cake pan or shallow metal bowl and chill in the freezer for 20-30 minutes until it is quite cool (45-60ᵒ F). Meanwhile, beat the butter in a mixer for 2 minutes on high until the butter is lighter in color and aerated. Add the cooled syrup in two additions to the butter beating 1 minute after each addition. Add the vanilla and beat 30 seconds until smooth. Can be used immediately. You can store this buttercream at room temperature for 2 days, in the refrigerator tightly sealed for 2 weeks, or in the freezer for 2 months. Whoa. You are blowing my mind!! No more whipping meringue for 30 minutes as the sugar/egg white mixture cools!? I have to try this. Immediately! This is very interesting and I will definitely try. We have made SMBC once or twice and had success, but we always make Italian Meringue Butter Cream because we read years ago that it was more stable than SMBC. We’re not sure exactly what was more unstable about it than IMBC, but we’ve always had great success with the IMBC. We think they taste pretty much exactly the same and wonder why it seems that most cake decorators make the SMBC. Maybe because Martha Stewart loves and promotes it! HA! Possibly you could explain the difference in the two regarding the stability? So with this new method, would you say it (SMBC) is now more stable than making it the old way? Would IMBC still be more stable? Your articles are always very informative and I enjoy reading them. Italian meringue is more stable because the syrup “cooks” the egg whites and they become firmer. French meringue, which is just sugar and egg whites, just dissolves after a while, italian meringue holds its shape. Swiss meringue is more stable than french, but still isn’t as stable as italian. I have this same problem. HOW do we illiminate this???? This is more stable than any IMBC I have made. It goes together quickly so I would make a half batch if I were you and compare. Good luck! Thank you for your reply Summer! We will have to try it! Dear Summer i just came across this site while i was searching for something else/ the phrase” i start with the butter” just caught my attention like magnet heheheheh, hope none of my bakers friends sees this as i was thinking this was my top secret way in making SMBC for so many years now and defeating them every time: by time of preparation, stability, texture , colour,flavouring, taste………. you name it hehehehe. have a good blessed day Dear Summer, and keep up the good work. This is the best news I’ve heard all day! Thank you! Thank you! Thank you! Iw as wondering the same question. I made the syrup and it has been in the fridge for a week. Will it still be good to use next week? What about using brown sugar? 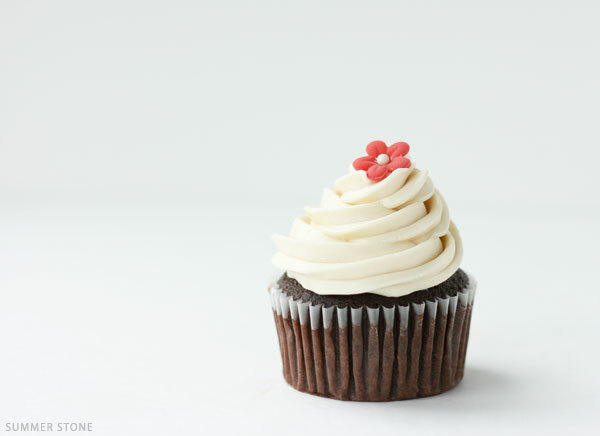 Have you ever tried that and does it make for a richer tasting frosting? I’m thinking about using it for almond flavored SMB. Unbelievable!! You are a genius!!! I’m very intrigued! I’ve been haning trouble with my SMBC being way too soft in my warm Cal weather. I’m going to see if this could be my fix. I’ll post my results. Can’t wait. I put this in a 120 F oven and it held up very well. 120F! WOW! I’m sold! Gonna try this is our very warm tropical weather! Would this have the same volume and density compared to doing it the traditional way? When compared side by side immediately after making the two the traditional method is slightly lighter in texture. By the next day they are identical. In a blind tasting my cake friends could not tell the difference. Whaaaaaat?! Reallyyyyyy.. I cant wait to try! Why dint i see these many yearssss…. I can’t wait to try this! Do you have any idea how many eggs it takes to get 1 cup of whites? Usually 7-8 large eggsget yields one cup. When you are ready to use the reserved frozen batch, is it safer to thaw in the refrigerator overnight or countertop? It actually doesn’t freeze because of the high sugar content. It just becomes very thick. You can zap it in the microwave to 10-20 seconds to raise the temperature a touch. 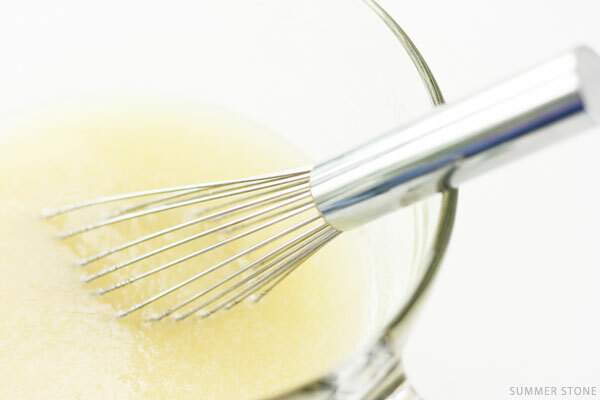 Are you using the whisk or paddle attachment when you beat the butter and then when you add the egg syrup mixture? Love this idea! Ive always found that as long as beat the smbc well, once all the butter is incorporated, then I have no problem. Even if it starts to look soupy at one point, beating always fixes it. But ťhe idea of having the “syrup” on hand is too good to pass up! Thank you!!!! Very important information! I made a batch of SMBC this weekend and i really would have loved to try out this technique. Still though can’t wait to try it out. Will definitely come back here to give feedback. I’ve never had major issues with SMBC, but if it’s more stable and heat resistant, that’s a winner on my book. Definitely worth a try! Thanks. Does this SMBC crust over like regular buttercream? No, it acts just like a traditional SMBC and does not crust over because of the high butter content. This sounds great. .. I’m going to try it. At what point do I incorporate the corn syrup in your recipe? How long can you leave this SMBC at room temperature? I usually go with a two day limit. Would it have the same effect if I use ghee butter? I don’t think so because you are losing the proteins that are necessary for emulsification. Maybe it would work if you added lecithin or another emulsifier but you are probably better off with butter. When do you add the corn syrup? Thanks!! I had the same question… but didn’t notice until I was done with the microwaving… would it work with out or should I rey to add it in now? the syrup mixtur is in my freezer and I was going to pull it out to finish the recipe tomorrow. Tirzahe, I know this post is from a long time ago, but just curious if you tried it and how it was? Definitely I’m going to try it. I usually make IMBC with no problem.